Can you identify any of the players in this photograph? A black and white photograph of the Consumers Gas Minor Juvenile "A" Hockey Team. This photograph was taken in the old Whitby Community Arena located on the block bound by Brock, Ontario, Green, and Gilbert Streets. 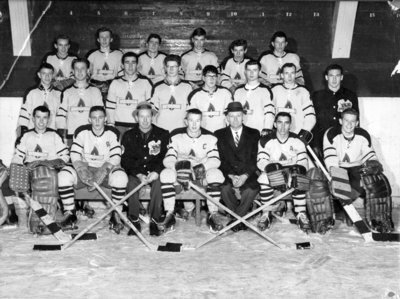 The Consumers Gas Minor Juvenile "A" Hockey Team was part of the Ontario Minor Hockey Association and the All Ontario Champions for the 1961/62 season. Consumers Gas Minor Juvenile "A" Hockey Team, 1961, Photographer Unknown. Whitby Archives D2013_012_001.